An entire section of the criminal laws in New York is dedicated to offenses involving computers, computer programs, and computer data. The number of laws and differing charges related to computers means you need New York City defense counsel experienced in this area of law – you need a knowledgeable New York City Computer Fraud Lawyer like those at Koch Law. Nearly everyone has a desktop or laptop computer in his or her home – most people also use a computer at work. Tablets, smartphones, and other devices are entirely commonplace. We even have artificial intelligence in our living rooms. Broadly, New York City computer fraud involves the use of any device, not just computers, computer network, computer program, or the Internet to defraud a company, individual, the government, or other entity. However, as these electronics became more popular, they also became more complex, which made crimes involving computers more numerous and harder to clearly define. That’s led to several offenses that fall under the definition of New York City computer fraud. 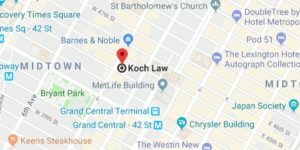 As an New York City criminal lawyer handling computer fraud, Koch Law is experienced in other white-collar defense. Also similar to these other fraud charges, computer fraud can be an NY state or federal crime. If you were arrested for computer fraud, it’s important to know the exact charges against you. An NY computer fraud lawyer now has to defend against 10 different offenses involving computers, just at the state level. These charges range from unauthorized use and tampering with computers, to unlawful duplication of materials. Unauthorized Use of a Computer – the unauthorized use of a computer, the Internet, computer network, or computer program for any purpose. Computer Tampering in the Fourth Degree – using a computer, network, or program without authorization and intentionally altering or destroying part of the device or information stored on the device. Unlawful Duplication of Computer Material in the Second Degree – unlawfully copying, reproducing, or duplicating information stored on a computer, network, or program or unlawfully copying medical records from the same sources with the intent to commit another crime in the future. Computer Trespass – the unauthorized use of a computer, computer program, or computer network for the purpose of committing another crime in the future or for knowingly gaining access to computer material. Computer Tampering in Third, Second, or First Degree – tampering with the information or data on a computer, program, or network for the purpose of committing a different computer crime, in order to intentionally alter or damage computer material or information, or to intentionally cause damage to the owner of the information. Unlawful Duplication of Computer Material in the First Degree – copying, reproducing, or duplication information from a computer, program, or network without authorization and for the purpose of depriving the owner of economic benefit or to commit a separate felony. Criminal Possession of Computer Related Material – knowingly possessing, in any form, information that was unlawfully taken from a computer, network, or program, when such information was taken to benefit the defendant or another person other than the owner of such information. Operating an Unlawful Electronic Sweepstakes – the use of a machine, computer, network, the Internet, or other electronic devices to conduct an unlawful sweepstakes through an entertaining display or promote similar, unlawful sweepstakes. To properly and fully defend against charges for computer fraud, you need the advice and assistance of New York City computer fraud lawyer. At Koch Law, we provide a tough defense to all charges for NY computer fraud and federal white-collar crimes. This strong defense begins with a single conversation – a free, initial consultation with one of our NY defense counsel. Contact our NY office to arrange this important first meeting.